Founded in 1608, Quebec, the Capital of New France, was destined to play a crucial role as one of the great port cities of North America – both as an Atlantic port and as a gateway to the great inland river systems of the continent. With "Quebec, Birthplace of New France", second volume of the Mendel Guides, we descend the Côte de la Montagne to the lower town to discover a wealth of history, architecture and art. Richly illustrated with historic and contemporary images, the book takes readers into the interiors of significant buildings and provides spectacular views of the city and the St. Lawrence River, often from angles that have never been photographed before. Discover the site where Samuel de Champlain built his first habitation in 1608, and Place Royale, where French merchants constructed fine residences during the 17th and 18th centuries. 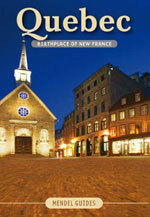 Learn how, under British rule, Quebec became one of the most important port cities on the continent. Explore waterfront docks, and 19th century banks and warehouses. Discover the remarkable interiors of Notre- Dame des Victoires, the Musée de la Civilisation and the Auberge St-Antoine, a remarkable hotel/Museum that is also an important archaeological site. Size: 24 x 16.5 cm; colourful pictures and photographs; soft cover.